Shiraz by Serafino of McLaren Vale. The generosity of fruit character and the seamless integration of oak and tannin ensures the finish is fine, elegant and long. Serafino Maglieri came to McLaren Vale in 1968 and devoted his life to wine. Terremoto vineyard is planted north west to red loam over limestone, just on the western side of McLaren Vale township. He gained international renown after winning Trophy for Best Shiraz and Red Wine of the Year at the prestigious London International. Maglieri was crowned Bushing King on two occasions, also winning the Trophy for Australia’s Best Shiraz in the 1997 Great Australian Wine Challenge he became internationally acclaimed after winning the Trophy for the Best Shiraz and Red Wine of the Year at the London International Wine Challenge. The success continued with the 2002 Serafino Cabernet Sauvignon winning Australia’s Cabernet of the Year in the Winestate Wine of the Year awards. The 2004 Cabernet Sauvignon was awarded Best Cabernet Advertiser Top 100, 2006 Cabernet Sauvignon winning the Bushing King Trophy and 2007 Cabernet again voted Best Cabernet in the Advertiser Top 100. Today the Serafino vineyards have expanded to 300 acres of prime McLaren Vale land and a new state of the art winery, purpose built for small batch production. The modern Serafino estate and wineworks are set in the picturesque grounds of a resort complex which now boasts a newly refurbished restaurant overlooking Lake McLaren. Considered one of the most beautiful wine regions in Australia, McLaren Vale has gained an international reputation for producing wines with intense flavours and distinctive characters. Nestled between the sea and the hills, enjoying a Mediterranean climate, the growing seasons of serafino's vineyards can be compared to parts of southern Europe. The moderate weather and pristine environment contribute to the production of the outstanding Serafino wines which express the unique qualities of the region. Serafino can rely on his dedicated growers and skilled winemaking team to create McLaren Vale's most generously flavoured wines. The quality of fruit is paramount and Serafino's vineyards are idyllically positioned on the region's best soils. The highest standards of viticulture and sustainabale land management practices are crucial to the quality of wines. Serafino's multitude of awards and accolades would not be possible without a fabulous team whose dedication, work ethic and attention to detail ensures success. The inspirational team includes cellar staff, vineyard managers, the highly skilled and passionate growers of McLaren Vale and a meticulous army of fruit pickers. Serafino's vineyards have expanded to three hundred acres of prime McLaren Vale viticultural assets, fruit is vinified in a state of the art winery, purpose built for small batch production. The best grapes are set aside after harvest and treated to a crush and cold soak, inoculated to choice strains of yeast and vinified with a view to creating intense wines which are treated to maturation in the finest French and American oak barrels. Serafino is proud that his new winery, products, winemakers and brand portfolio are getting the acknowledgement they deserve. With a wide range of distinctive wines, Serafino is well known for being character filled and at the forefront of winemaking in the McLaren Vale region. 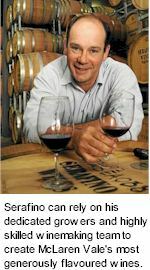 Serafino makes wines that are a tribute to his Italian ancestry, soft and mellow wines at their very best. 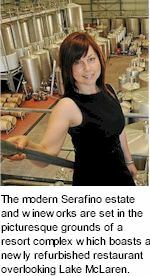 Serafino is able to offer an extensive range from 300 acres of vineyards, including the flagship Serafino Sharktooth label, Serafino and Sorrento ranges, Goose Island and Bellissimo. Take a chance, taste and enjoy, you will not be disappointed!